The Outreach team is busy working within St. Mark’s and the larger community to provide and support programs and initiatives to meet a variety of needs. St. Mark’s participates each year in the Whitby Christmas Hamper program, providing Christmas Hampers to over 45 local families. This program would not be possible without the support of the congregation, our community, the Whitby Rotary Club, the St. Mark’s Players, as well as numerous other St. Mark’s Church Groups. St. Mark’s has been running a reverse offering collection for the last year in support of St. Andrew’s Outreach Program . This collection of non-perishable food items, diapers, formula and personal care items is delivered monthly to St. Andrew’s to assist them in their support of 150 local families. St. Mark’s also collects back-to-school items for the Back Pack Program at St. Andrews. This year over 100 children received the necessary items (back packs, school supplies, lunch bags, new shoes etc.) to take them back to school and ready for a new and exciting year. Wednesday, December 6, 2017 is coming soon! Sign up sheets are on the kitchen door. St. Mark’s has been the host of this well attended event for many years. Seniors and their Meals on Wheels drivers and support team enjoy a traditional turkey dinner, with caroling, and all the festivities, including a visit from Santa. The 4th Whitby Beavers, Cubs and Scouts join us in hosting and welcoming our guests! A group of enthusiastic singers visit Lakeridge Health Whitby each week to sing and visit with patients. For more information, or to join this merry band of singers, please contact the church office 905-668-3091. 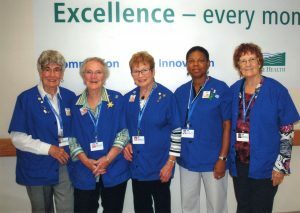 Parkinson’s Support Group – Durham Region was established in 1981 by Pauline Toenjes, a member of the St. Mark’s family. The group provides information, support and contact for people living with Parkinson’s, their families, friends and other CarePartners. St. Mark’s has been a community partner and sponsor of this group since the mid 1980’s. St. Mark’s has contributed to this Whitby Rotary project under the name “Pennies for Papas” and Dimes for Dominicans for a number of years . The program supports senior men and women from Haiti who went to the Dominican Republic to work in the sugar fields many years ago and cannot go back home, as they have lost their families. Coin jars in the narthex and upper hall are available for donations. All funds are forwarded to Whitby Rotary in support of this program. Thank you again from members of the Outreach Committee for your support of this project. Donations can be left in the clearly marked plastic tubs in the upper hall.